Ordinarily, for Catholics throughout the world, the month of November commemorates the deceased family members, friends, and loved ones who have been called home to the Lord. For people in the Pittsburgh area, November was ushered in by the mass shootings that took place at the Tree of Life Synagogue in Squirrel Hill. 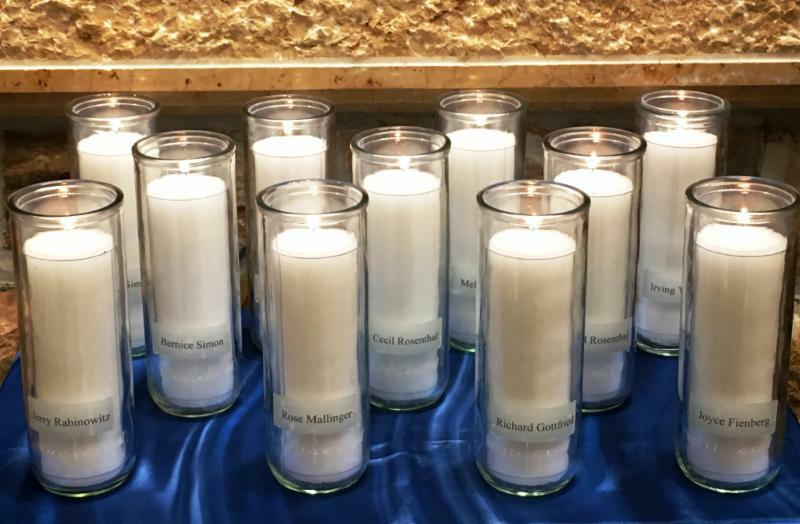 This horrific hate crime took the lives of 11 faithful members of the Jewish community and wounded six others, including four police officers. 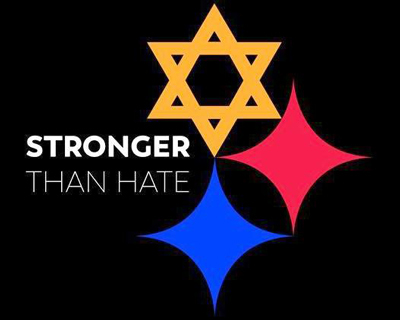 What has emerged from this tragedy is the mantra STRONGER THAN HATE with an image featuring the familiar Steelers logo with one of its three diamonds changed to the Star of David. This logo is serving to unite all peoples in solidarity with their Jewish brothers and sisters. For the Felician Sisters at Our Lady of the Sacred Heart Convent in Coraopolis, PA, the traditional Evening Praise on the Feast of All Souls on Friday, November 2, included a remembrance of the eleven individuals who had come to worship in the synagogue and were martyred there. The service also honored the five Felician Sisters who passed away during the year, as well as family and friends who have gone to the Lord. 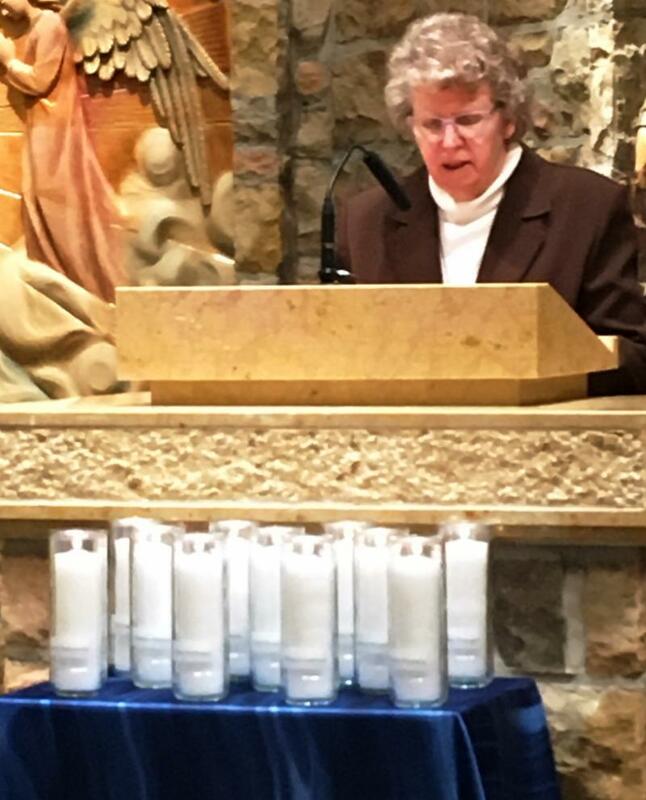 As SM Sharon Iacobucci, local minister, read the names of each deceased sister, family members, and those of the Jewish community, SM Francine Horos lit a candle in their memory which burns beside their pictures on the side altar in the chapel. 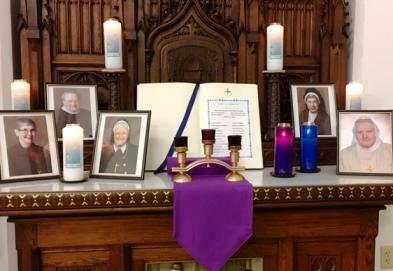 These pictures will remind the sisters to lift up in prayer the names of those written in the “Book of Remembrance” for this year. As a gesture of solidarity with their Jewish brothers and sisters, the book also includes the names of those who lost their lives in last week’s massacre. At St. Louise de Marillac Parish in Upper St. Clair, PA, where Felician Sisters have ministered for more than 50 years, a Mass of Remembrance also took place on All Souls Day. During the evening liturgy, celebrated by Father Joseph E. Sioli, administrator, the deceased of the parish and the deceased of the Tree of Life Synagogue were remembered. As the names were read, a member from each of the 55 families came forward and received a candle to be lit in their homes for special occasions. Eleven candles already lit in the sanctuary before the Mass burned brightly as the names of the eleven members of the Tree of Life congregation were read followed by the sung refrain. Students, staff, and faculty at Felician University in Lodi/Rutherford, NJ, gathered at the Rutherford Peace Pole to take time to challenge the hate and violence witnessed at the Tree of Life Synagogue in Pittsburgh, PA, with love and solidarity. Student Alexis Rodriguez, ’22, recited a prayer provided by Rabbi Lerman of the local Jewish congregation, Temple Beth-El. Staff members Sharon McNulty and Jodi Shelly honored those who died by reading aloud their names and inviting those gathered to reflect in silence. The vigil ended with the community praying the Tree of Life Prayer aloud. This entry was posted in Church, equality, Felicians, healing, HUMAN DIGNITY, Jesus, Justice, prayers, reflections, scripture, TRUTH, violence on November 6, 2018 by CSSF. The earliest certain observance of a feast in honor of all the saints is an early fourth-century commemoration of “all the martyrs.” In the early seventh century, after successive waves of invaders plundered the catacombs, Pope Boniface IV gathered up some 28 wagon-loads of bones and reinterred them beneath the Pantheon, a Roman temple dedicated to all the gods. The pope rededicated the shrine as a Christian church. According to Venerable Bede, the pope intended “that the memory of all the saints might in the future be honored in the place which had formerly been dedicated to the worship not of gods but of demons” (On the Calculation of Time). This feast first honored martyrs. Later, when Christians were free to worship according to their consciences, the Church acknowledged other paths to sanctity. In the early centuries the only criterion was popular acclaim, even when the bishop’s approval became the final step in placing a commemoration on the calendar. The first papal canonization occurred in 993; the lengthy process now required to prove extraordinary sanctity took form in the last 500 years. Today’s feast honors the obscure as well as the famous—the saints each of us have known. Click here for more on the Feast of All Saints! This entry was posted in Blessed, celebrations, Church, conversiion, feasts, Felicians, healing, Jesus, MINISTRY, prayers, reflections, Saints, scripture, Spirituality, theology, TRUTH on November 1, 2018 by CSSF. A new movie to be released today is about Kermit Gosnell – A movie about the notorious Philadelphia abortionist Kermit Gosnell will hit theaters October 12th– one of the filmmakers, Phelim McAleer, gives us a preview of what to expect. The Charism of the Congregation of the Sisters of Saint Felix of Cantalice is to imitate Blessed Mary Angela’s boundless love of God and surrender to God’s Will in compassionate service, total availability, concern for the salvation of all people. There is another way, at least as important, in which Pope Francis acts a witness for life: the countless images of him embracing, kissing and caressing people with crippling or disfiguring injuries or diseases. No verbal argument could more powerfully refute the eugenic mentality behind the culture of abortion than the sight of a pope passionately celebrating human lives that many would insist are not worth keeping. This entry was posted in abortion, Church, Fairness, Felicians, Francis, healing, HUMAN DIGNITY, Mercy, NEGLECT, Pope Francis, PRO LIFE, TRUTH on October 12, 2018 by CSSF. 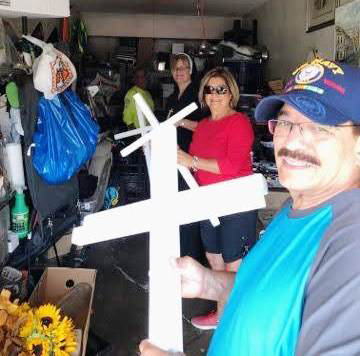 Associate Leonard Velasquez, his wife Mitchie, and Leonard’s brother Joe drove their pickup, loaded with 50 crosses, to Tustin, CA, to deliver them to Geraldo Campos of Aguilas del Desierto(Eagles of the Desert) on Wednesday, September 19. Over sopes (tortillas) and burritos, Gerry shared the story of how the Eagles began. Eight years ago, Ely Ortiz (the gentleman in the hospital that we’ve been praying for) got a call from his brother. He and their cousin were crossing the Arizona desert, from Mexico into the U.S., in hopes of a better life. They had kept up with the coyote who was their guide, but Ely’s brother was concerned about their cousin who was struggling with the harsh conditions. They decided to slow down to give him a chance to rest. They were never heard from again. Hours later, Ely contacted an organization that helped find people in the desert. After being treated disrespectfully and without compassion, Ely started the Eagles to help those concerned about lost loved ones. Four months later, Ely did find the bodies of his brother and cousin. Gerry explained that sometimes they locate a missing relative in detention, but more often they check their database and have the sad task of informing them of the death of their loved one. Relatives often ask the group to show them where the body of their loved one was found. Gerry was so grateful for the crosses. 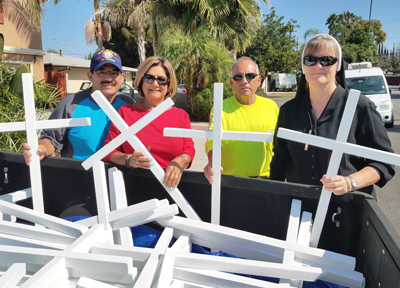 He said placing them at the site where a body was recovered would make it much easier to later guide families to the spot where their loved one died. Gerry explained that most of the leads they receive come from coyotes crossing the desert. Some of them care about the people they smuggle. They will send the Eagles a text, often with pictures and a location, where a body was located. The Eagles then organize a search, typically in the Arizona desert area. They drive as close as possible to the location, set up tents to camp overnight, and then walk in a group of 13 to about 30 (for protection) searching the area for the body. Sometimes they encounter travelers in distress, and offer water and first aid. Then, out of respect, they ask the person if they want to continue or call the Border Patrol. Gerry explained that they are there to help out, not be policemen. Each of the Eagles is very committed to their ministry. As soon as they return home, they are asking each other, when are we going back! Gerry shared the group’s disappointment that they cannot organize more searches, especially because they get so many tips. Each search costs $2500 to $3000 for gas and supplies. Most of the equipment they have was purchased with their own money. 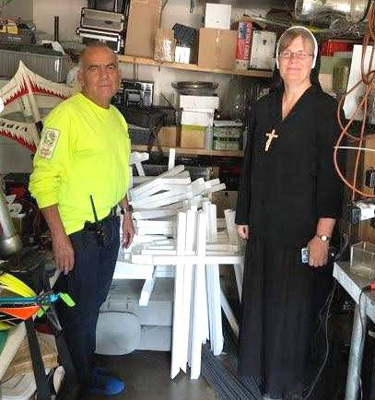 Stay tuned for the next part of the story, as the sisters in Pomona, CA, and several associates join the Eagles on a search in November. To read the English transcript of a KPBS news story on the Eagles of the desert, click here. This entry was posted in Church, equality, Fairness, Felicians, healing, homeless, HUMAN DIGNITY, Justice, MINISTRY, prayers, sick, Sister Mary Louise Edwards, CSSF, TRUTH on September 25, 2018 by CSSF.